(CNN) -- A veterinary pharmacy in Florida acknowledged Thursday that it incorrectly prepared medication used to treat 21 horses who all died around the time of an international polo match last weekend. 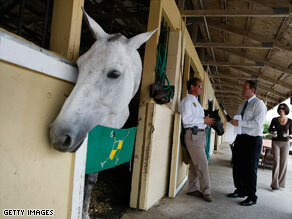 Veterinarian Scott Swerdlin talks with reporters Sunday about his Palm Beach Equine Clinic's response. The deaths of the ponies, witnessed in full view by spectators Sunday in a dramatic scene where horses collapsed one after another, have shaken the prestigious polo tournament at the marquee International Polo Club Palm Beach in Wellington, Florida. An internal investigation by Franck's Pharmacy in Ocala, Florida, "concluded that the strength of an ingredient in the medication was incorrect. We will cooperate fully with the authorities as they continue their investigations," the company said in a statement issued Thursday afternoon. "We extend our most sincere condolences to the horses' owners, the Lechuza Polo team and the members of the United States Polo Association. We share their grief and sadness," the pharmacy's chief operations officer, Jennifer Beckett, said in the statement. A memorial ceremony for the horses is scheduled for Thursday at the U.S. Open Polo Championship, where officials hope to resume play after matches were postponed by rain Wednesday. The memorial service will include a brief speech and a wreath-laying on the field. The pharmacy said it prepared medication for the horses on orders from a veterinarian. Liz Compton, a spokeswoman for the state Department of Agriculture and Consumer Services, told CNN that the agency is awaiting toxicology results from the animals and could not comment on the pharmacy's disclosure. "Obviously, we are going to follow any and every potential lead to get to the bottom of this," she said. The horses were trained by Lechuza Polo, a Venezuela-based team. Its captain, Juan Martin Nero, told an Argentine newspaper earlier this week that he had "no doubts" vitamins administered to the animals were at fault. "There were five horses that did not get the vitamin, and those were the only ones that survived," Nero said. The horses collapsed one after another in front of spectators at the International Polo Club Palm Beach in Wellington, Florida, while being prepared for a tournament Sunday. Most were dead within an hour. Post-mortem examinations done by a University of Florida laboratory found significant hemorrhaging in several horses, but the findings did not single out a specific cause. CNN's Kim Segal contributed to this report.